The term ‘drunk painting’ is meant figuratively (although, we’ll make sure to have some cheeky drinks available to you… if desired!). It’s a state of mind. When ‘drunk painting,’ we lower our inhibitions, remove the worry of what our art looks like, and focus on having fun so that we can create a masterpiece! Using acrylic paint as the medium, students will learn about paint application, brush-work, colour mixing and abstract painting. Kim’s current work takes its form in paintings dealing with images of beauty, gender and Queer-identity. Her artwork has been exhibited in multiple galleries throughout the United States and Australia. Kim’s painting ‘Start the Riot’ is currently touring Australia as part of the 2015 Archibald Prize Finalist Exhibition. 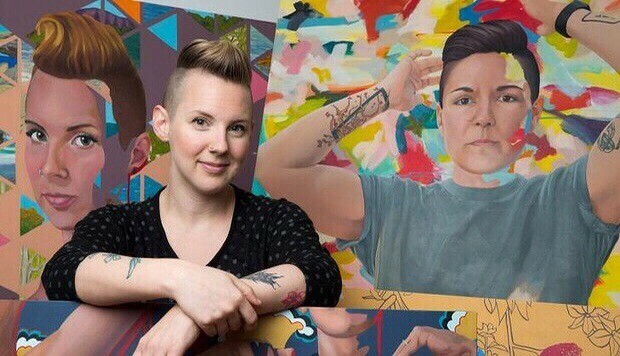 She recently won the Midsumma Visual Arts Prize, and her painting is the hero image for to 2016 LGBTQ Festival in Melbourne, Australia.